Autumn’s in full swing, and that means the holidays aren’t far behind. But before we start talking turkeys and tinsel, there’s another holiday that provides a fantastic outlet for decorating creativity: Halloween! While some people go to the extreme with fantastic light shows or outrageous collections of décor that take years to assemble (and almost as long to put up), most of us don’t have the time, funds, or even space to go that far. 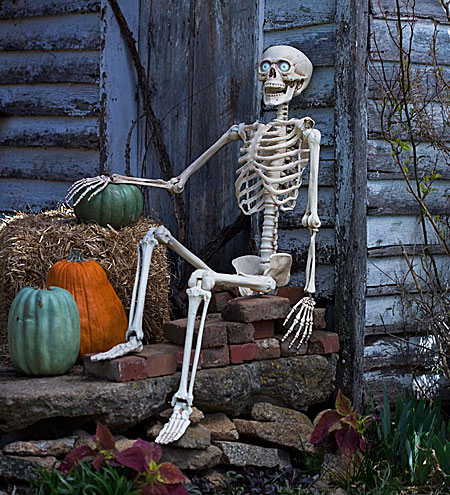 Fortunately, you can make a ghoulish impression on trick-or-treaters with any size home or yard and just the amount of effort you want to spend. Start at the Beginning: Pumpkins! Ah, the jack-o’-lantern: the original Halloween decoration. 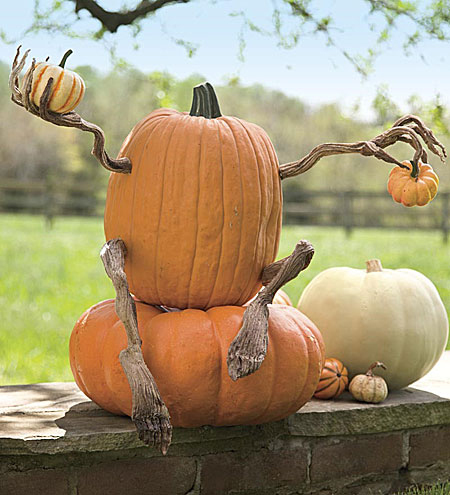 If you do nothing else for Halloween, inviting one or more of these grinning gourds to grace your stoop is a must. Pumpkin carving has come a long way in the last century, and there are now numerous carving kits available, often with templates for various carving skill levels. Lighting pumpkins is also a lot safer and easier that it used to be; instead of burning a candle (or trying to get a flashlight to face juuust the right way), battery-operated lights give you more flexibility. You can use imitation tea lights for a gentle glimmer, fake candles that flicker just like the real thing, or even strings of lights wound into Jack’s belly to give an all-over glow. Of course, many of us aren’t fans of the messy process of cleaning out a pumpkin’s insides; fortunately, slime-free jack-o’-lanterns are now possible! If you or your kids are into artwork, pick up some acrylic paint and give your Jack a sneer, a snicker, or a smile without picking up a knife. For those looking for something less potentially messy than paint, press-in pieces make decorating fun for even very young kids. Want something slightly sophisticated but still spooky or silly? 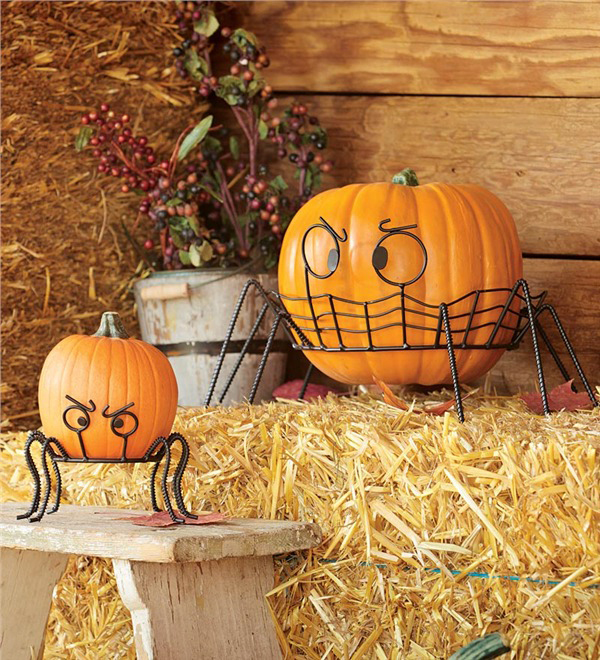 Pumpkin holders are about as easy as it gets. Ready to move beyond pumpkins, but no yard to speak of? No problem! Even small areas can make a big impact. There are a couple of different ways to do this: a focal piece or a theme. Maximize the eerie! By filling a tight space with one large, impressive piece, you focus observers' eyes and get their knees shaking (or get the giggles going) before they even get to the doorbell. 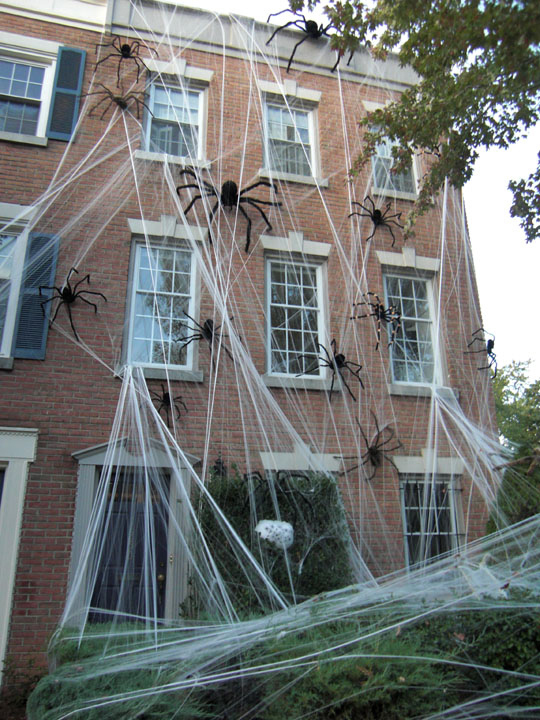 Blow trick-or-treaters’ minds with a tall, imposing figure that speaks and moves, or give them the heebie-jeebies with a huge spider web or a resident arachnid just waiting to pounce. Either way, it’s one decoration, but loads of impact. It’s also the easiest way to decorate a small space: pick one piece, set it out, and you’re done! Picking a single idea for Halloween and scaring up elements to match encourages family members to be creative in how they realize the theme in a small space. Remember that your whole house can make an impression, not just your walkway or front stoop. In other words, think vertical: look at your home and think about how you can expand your theme upwards, taking advantage of a porch roof, windows, and even gutters. One brownstone owner in Brooklyn creeped out the neighborhood kids with skeletons literally climbing the walls! No matter what your inspiration, choosing a subject and taking full advantage of the canvas you have available lets even your small space spook with the best of them on Halloween night. Those who have a large yard or acreage to work with are blessed with a lot of options, but sometimes having so much space to fill can be overwhelming. Keep the options from making you dizzy by starting with something simple and expanding from there. Like those working with smaller spaces, you can always choose a theme, but a larger setting really lets you explore the topic. Instead of a single ghastly gravestone, build an entire graveyard; give zombies room to roam across your entire lawn; let ghosts flit through your fence and glide over the grass. Speaking of themes: if you have enough space, instead of a single concept, you can give each section of your yard its own bewitching premise. Your driveway can host a monster mash, while skeletal arms along your sidewalk grab at little legs scurrying towards the witch’s lair on your porch. 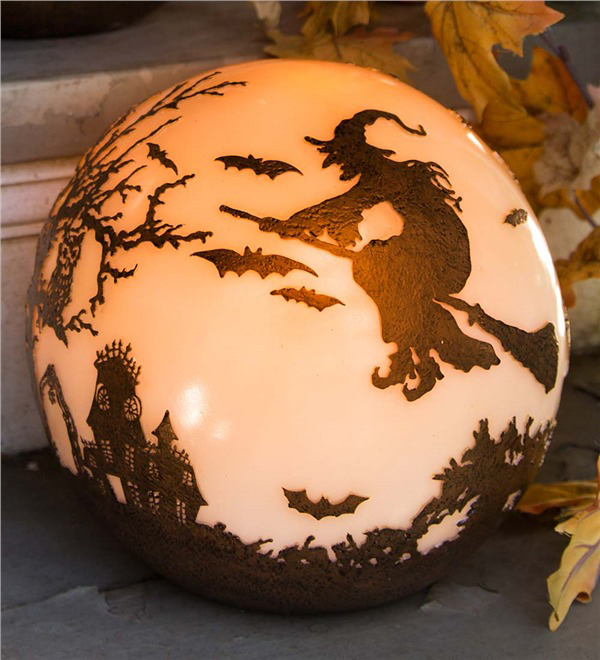 It’s a great way to still focus your decorating but get some variety into your All Hallow’s Eve. 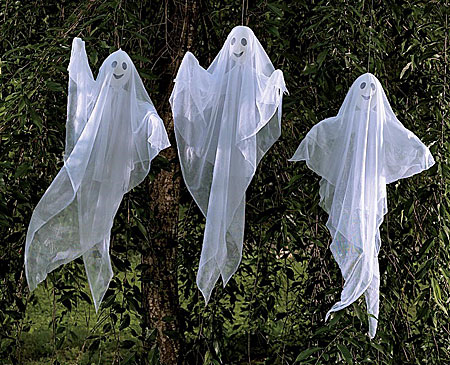 Everything you put up can also help guide your Halloween guests to the front door. 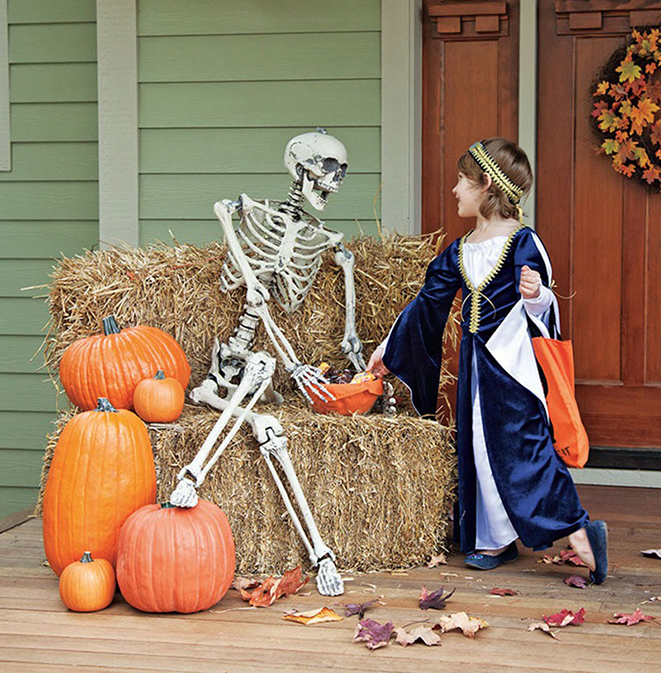 If you have a long driveway, a very large yard, or a house where the front door isn’t readily obvious, use your décor to steer trick-or-treaters in the right direction. Lighting can really help out here, so choose items that define and illuminate the path; you can even get your trees in on the act. The great thing about decorating for Halloween is that you can expand or contract your ideas to fit any space and still make a big impression. Whether you have expansive acreage or a cozy piece of sidewalk, you can elicit a laugh, a screech, or moment of weird wonder with just a little effort!